More great rapids in 20 miles than any other river I know. 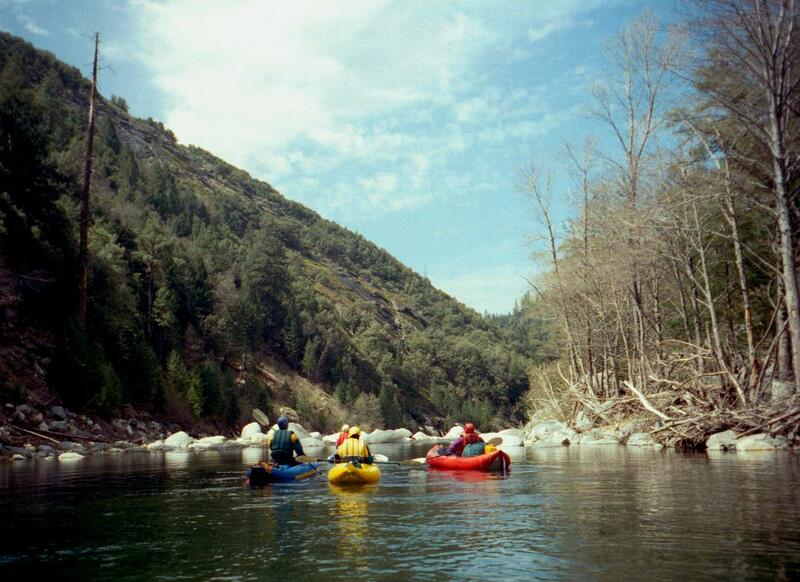 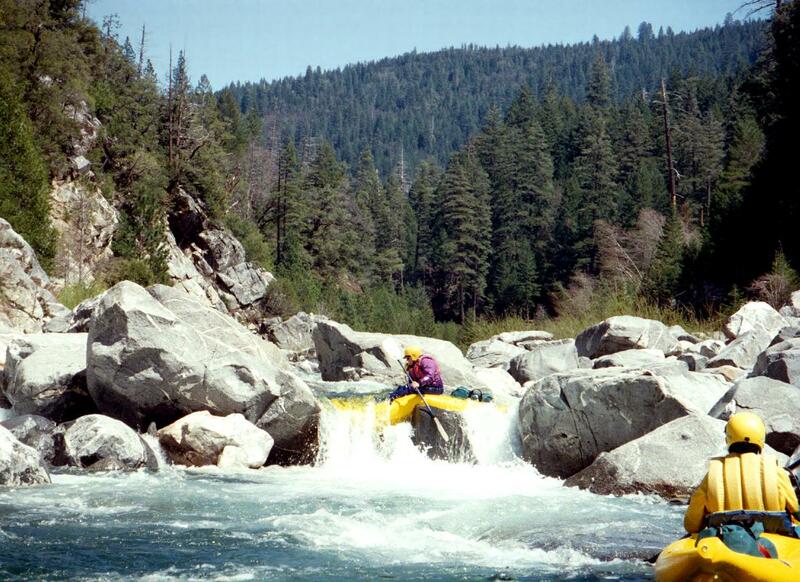 At low flows this is a classic run for inflatable kayaks, with more exhilarating whitewater per kilometer than perhaps any other stream in California. 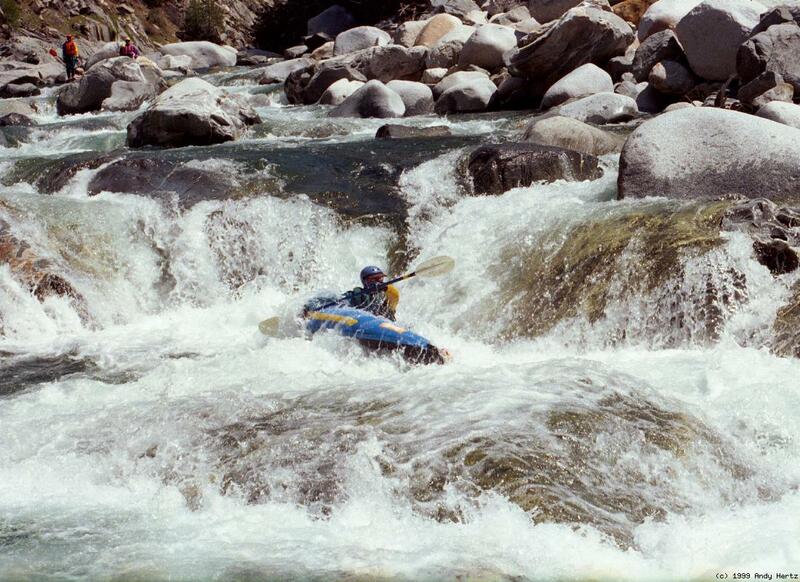 Above 500 cfs the hydraulics start getting large, making this run more appropriate for hardshell kayaks, who rate it class V- under 1000 cfs, then class V until 2000 cfs. 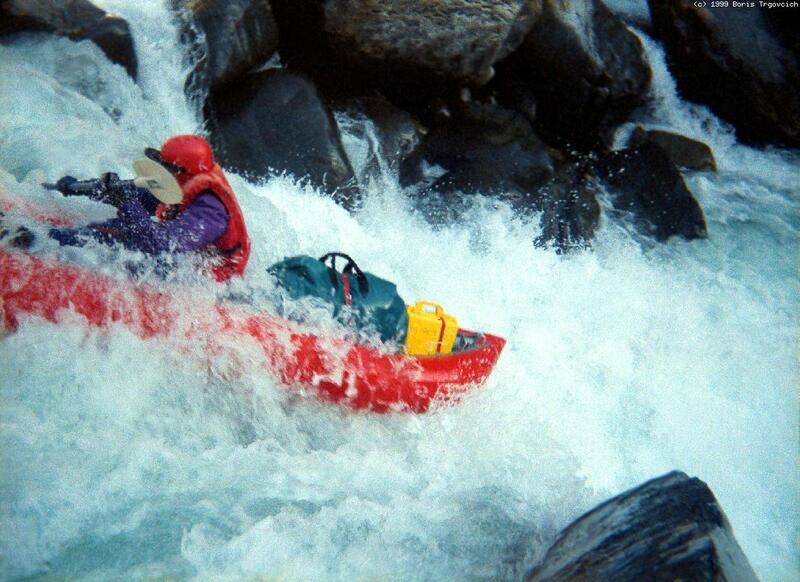 Another problem is that early in the season, sidestreams add considerably to the flow, causing a class IV run to transition into a class V survival fest. It is best to wait until late in the season, when the flow at put-in is quite similar to the flow at take-out. 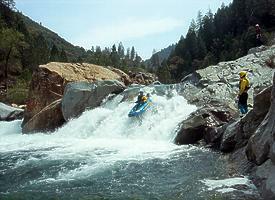 Even in snowy years the optimum flow window could be only a few days long, perhaps not even coinciding with a weekend. 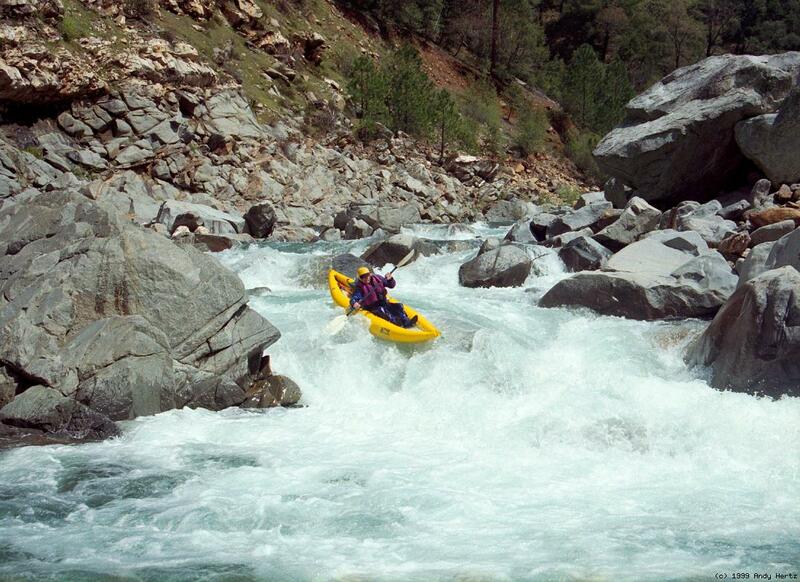 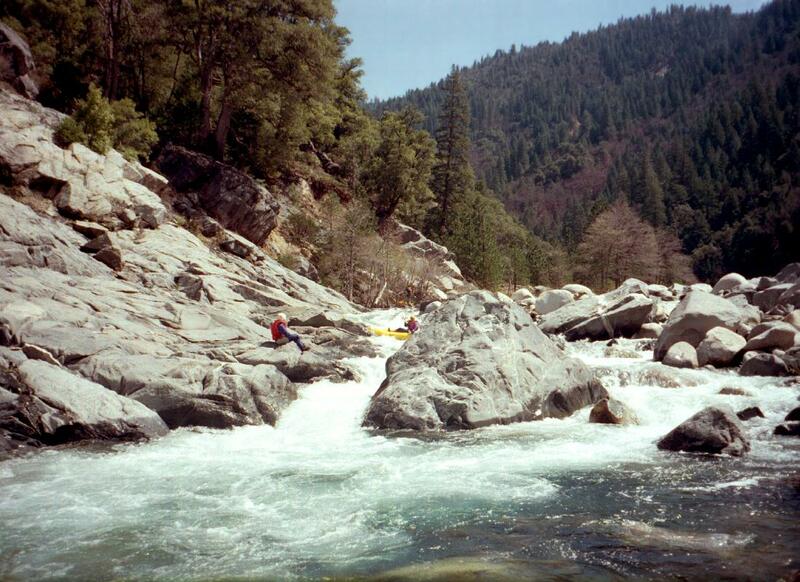 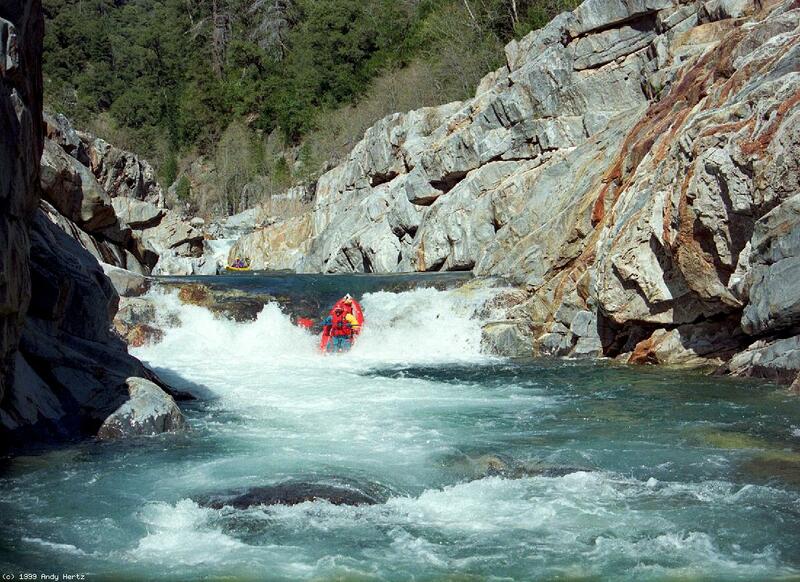 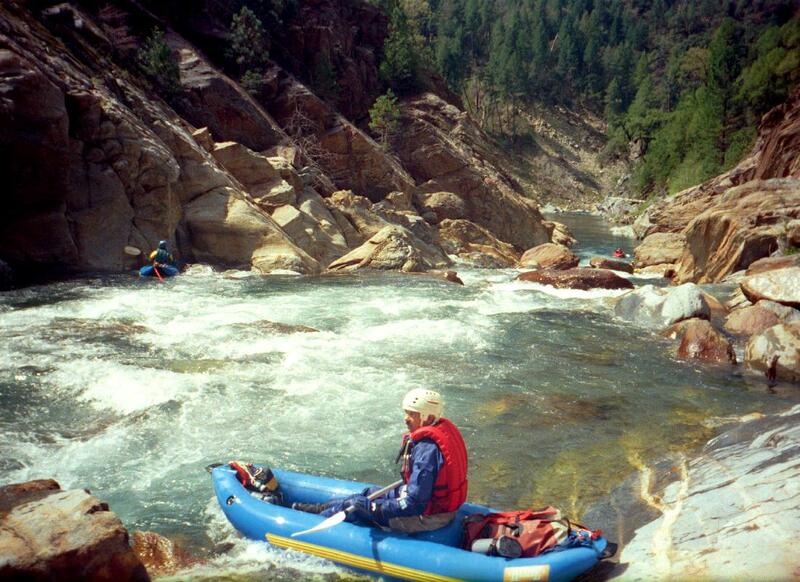 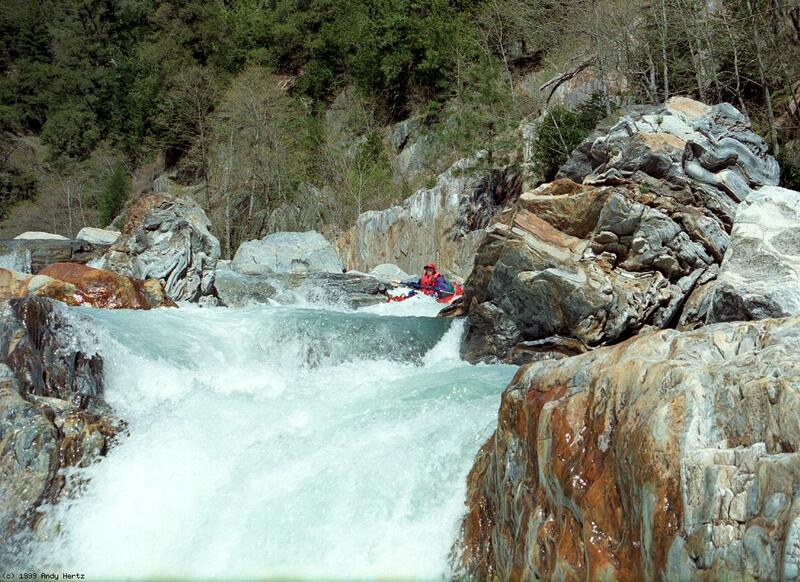 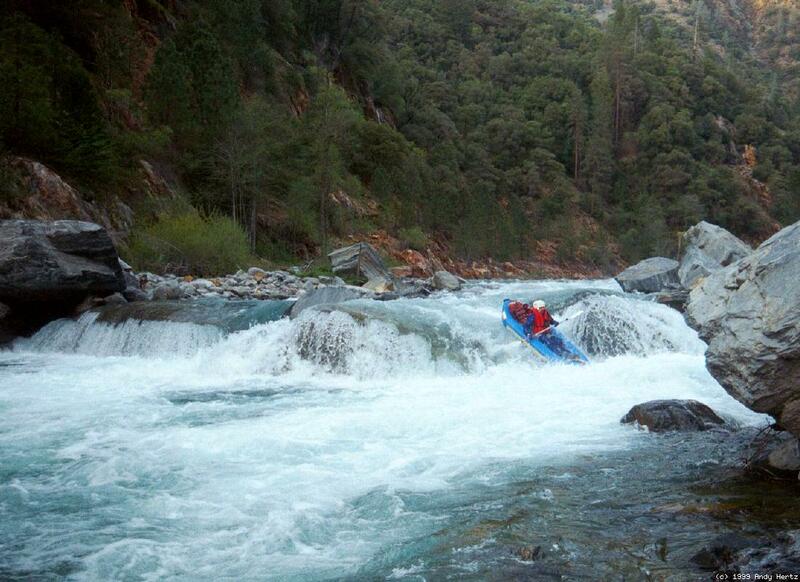 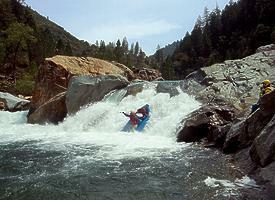 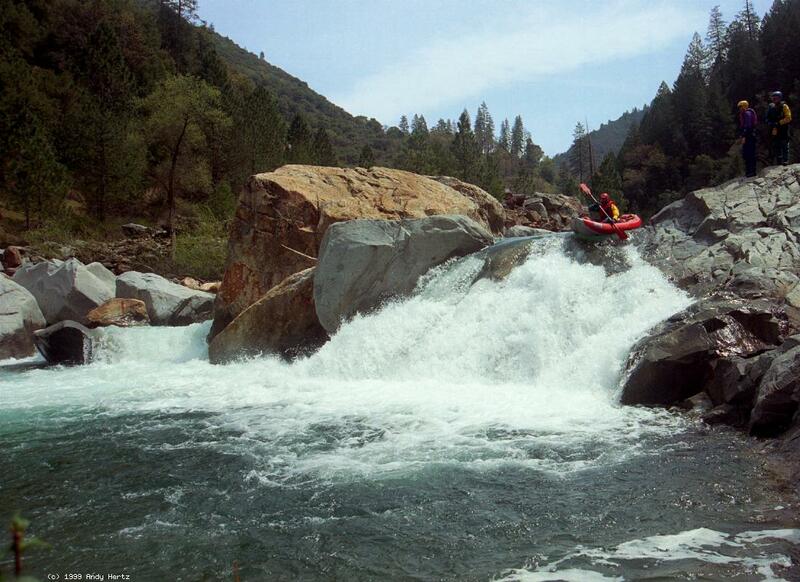 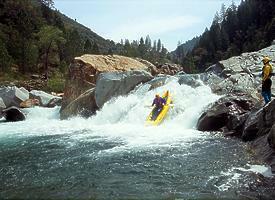 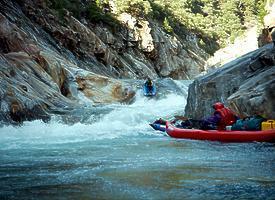 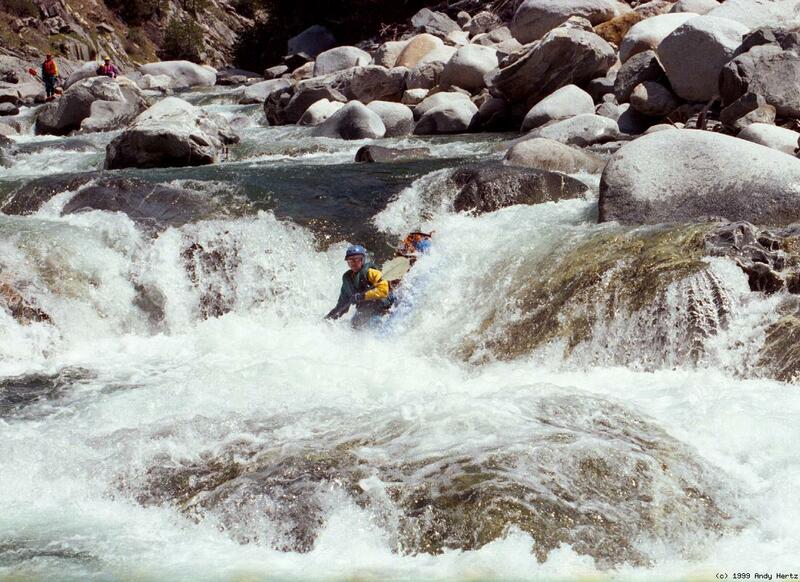 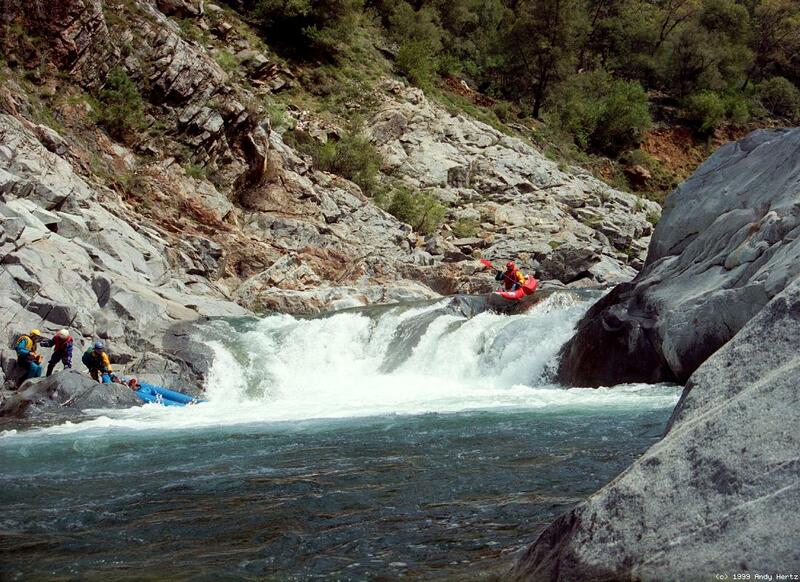 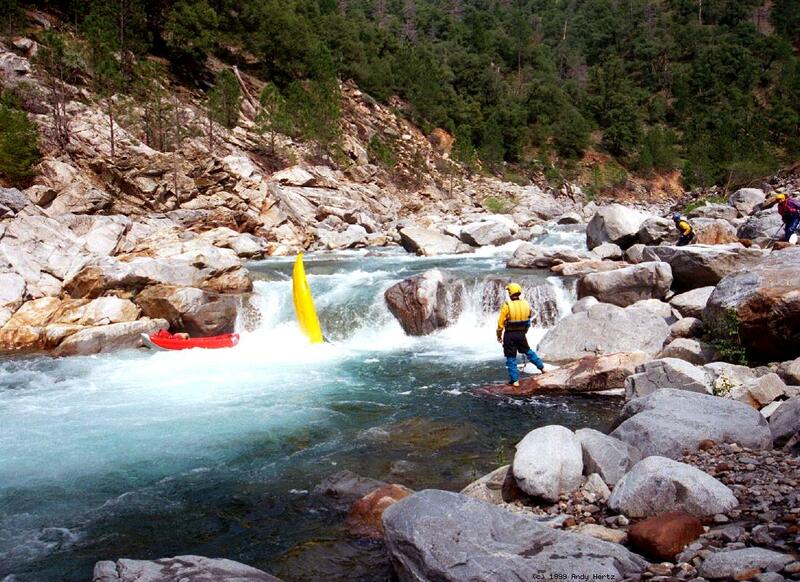 This run is well described in the Holbek/Stanley book, A Guide to the Best Whitewater in the State of California, although this segment is longer than stated. The book provides two black-and-white photos of the Rubicon, one showing a 15' waterfall, the other a stairstep rapid (called One in A Million) ending in a big drop. They say 2 portages are necessary, 5 portages recommended. 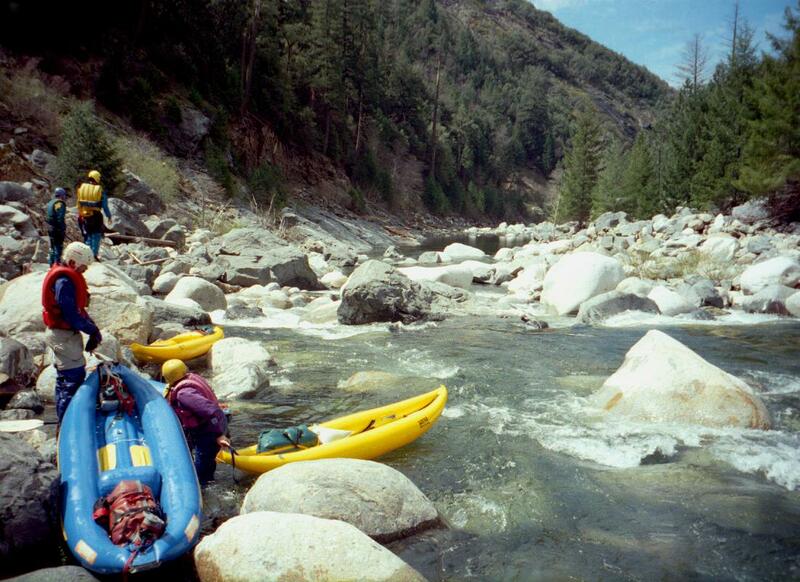 With less than a dozen portages around hazardous passages (usually relatively easy lines or boat drags at river level) it is possible not to run any dangerous class V+ rapids, provided you wait for flows under the hardshell minimum of 500 cfs. 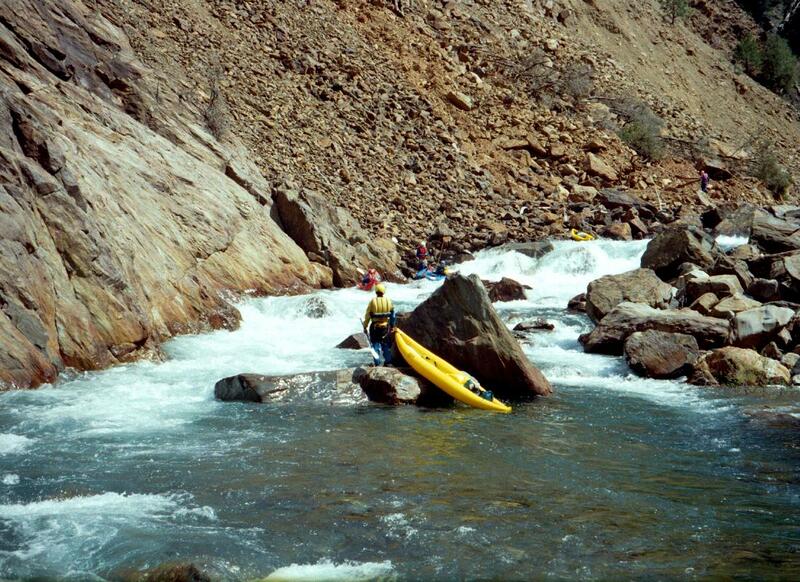 However, the sheer number of tough rapids and required scouts makes this an arduous run even at low water. 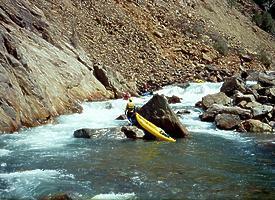 Look for the volume in Hell Hole reservoir, peak capacity 207,600 acre feet. 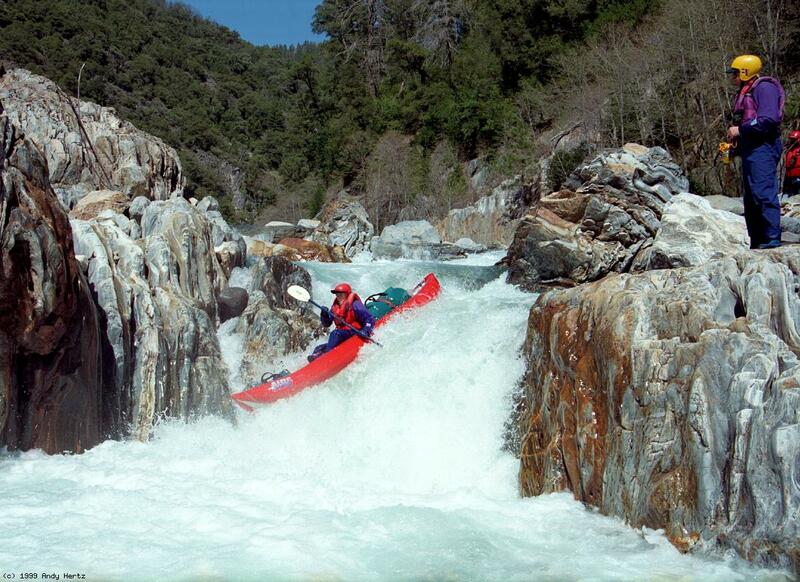 When spring comes, it starts filling with a fairly regular increase. You can estimate reservoir inflow, but only on days right before it spills, and assume it will be similar on days soon after it spills. 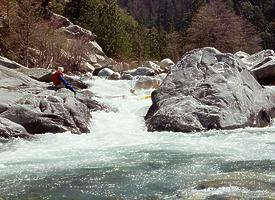 Do this by converting acre-feet per day to cfs. 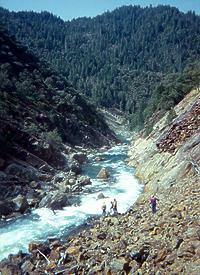 One acre-foot equals 43,560 cubic feet. Divide by seconds in a day (86,400) and you get 2 acre-feet equals 1 cfs. 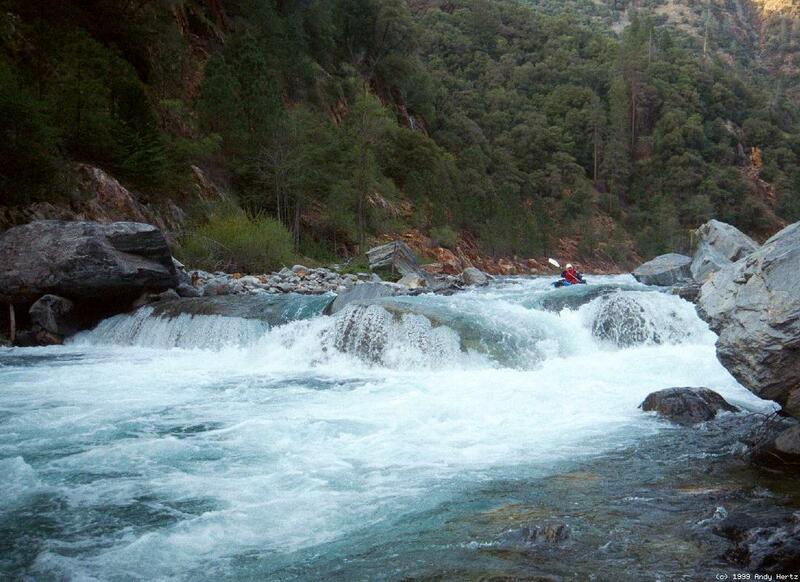 If the reservoir is rising by 2000 acre-feet per day, the inflow is 1000cfs. Hazard! 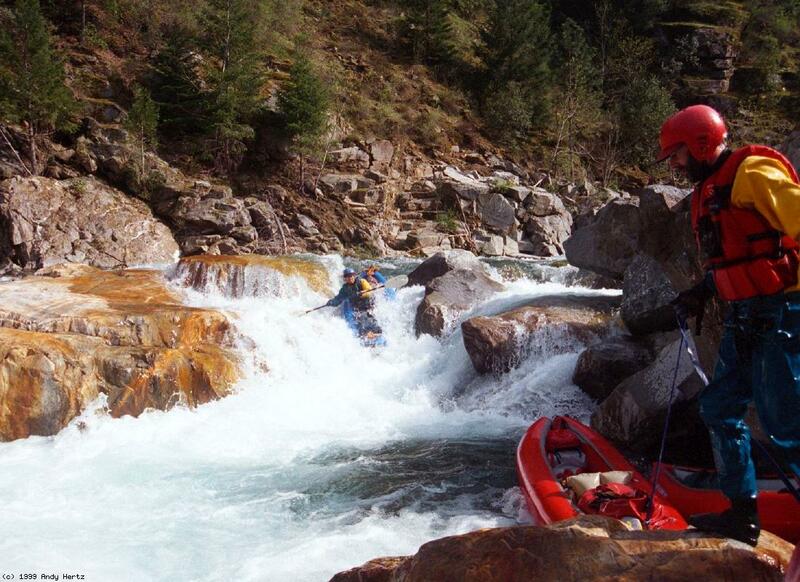 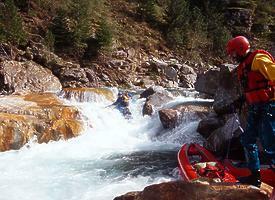 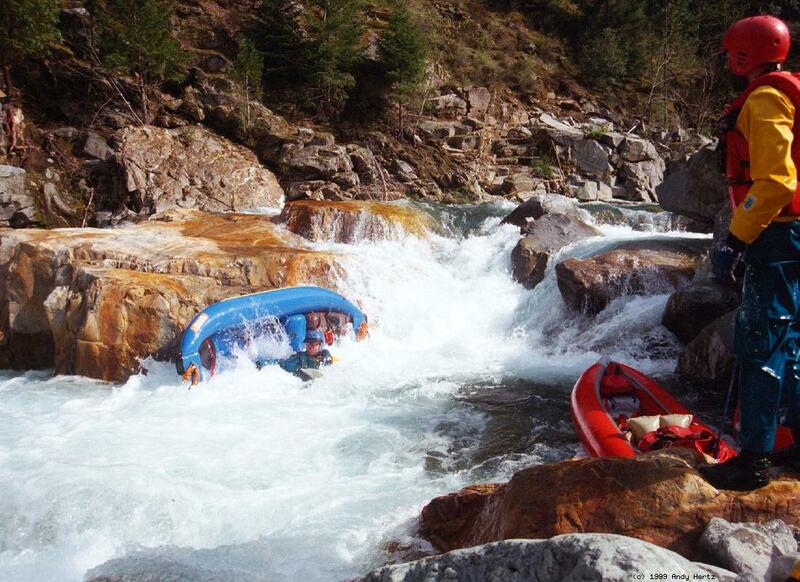 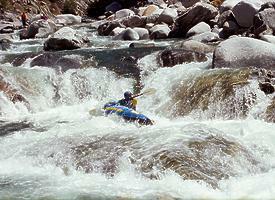 Most rapids are steep boulder bars, not bedrock drops. 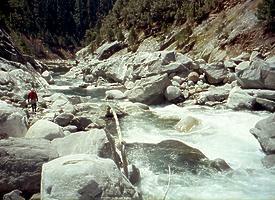 The riverbed changes from year to year. 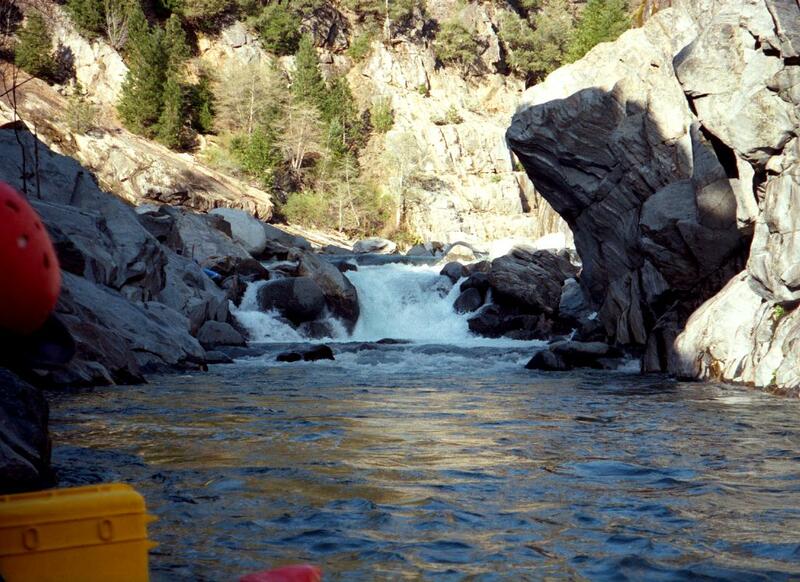 Undercuts and tunnels could lurk anywhere, especially near the bottom of class III-IV rapids that you might not have chosen to scout. 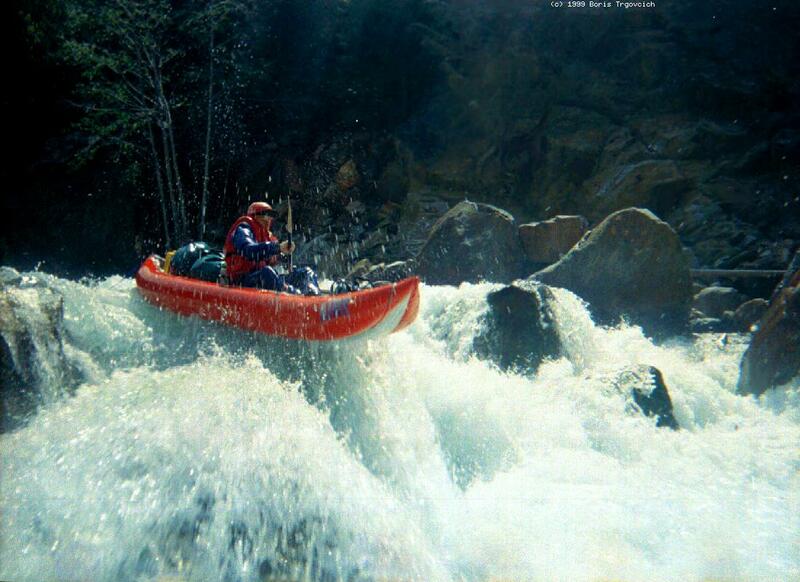 Be cautious, and try not to rush. 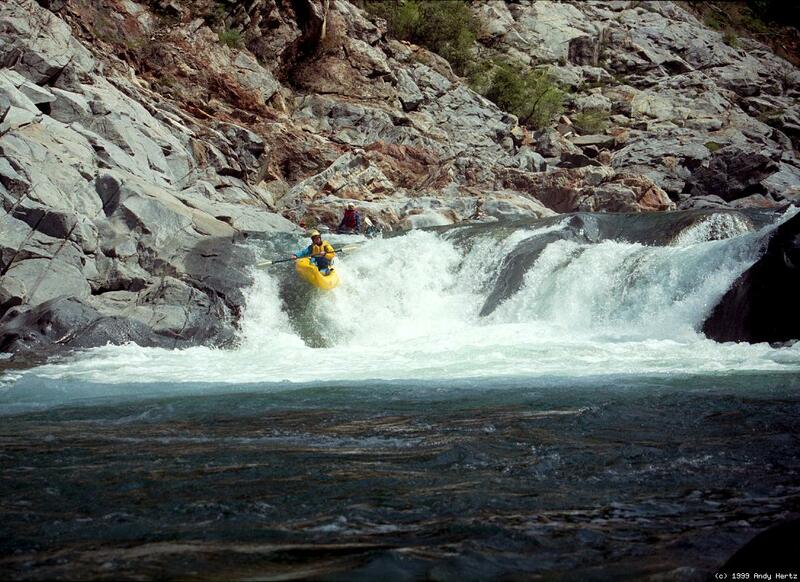 Thumbs down due to unavoidable undercut When in doubt, straighten out! 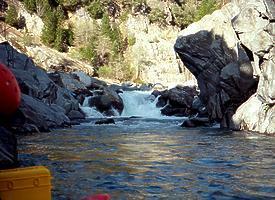 More photos of Ripple Rock Falls are in the Carnage Gallery. 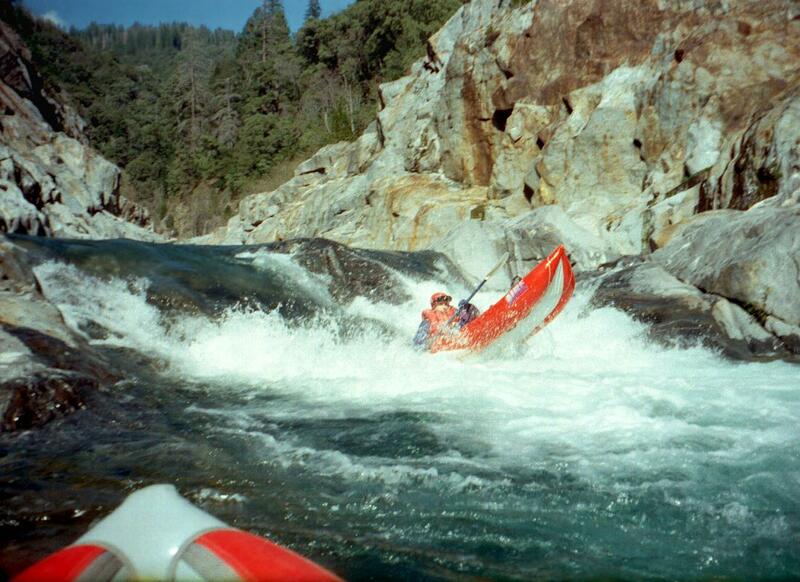 After portaging steep, high, rockstrewn falls Andy decides to run it - backwards! 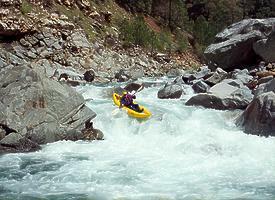 The drops keep coming as flows increase Kayak Motel: boats check in but don't check out! Pilot Creek enters on the left around mile 17. 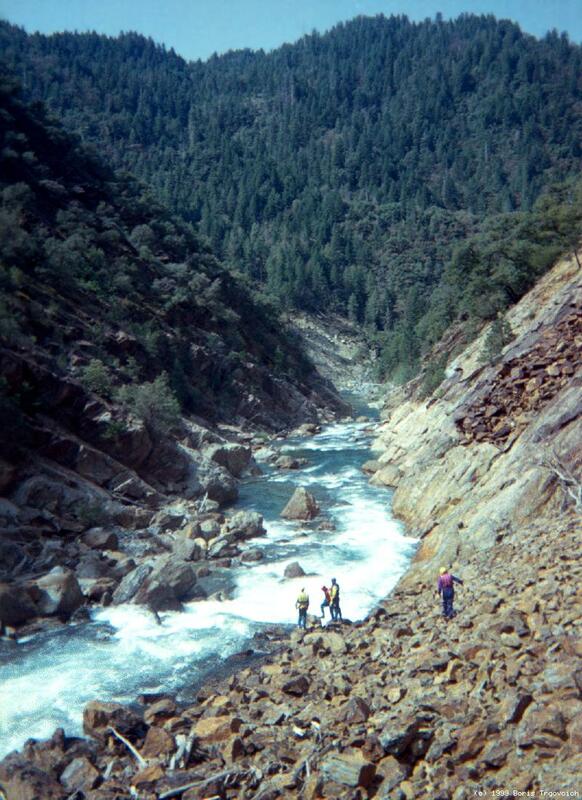 Class IV+ or V- rapids continue to takeout, although with more space between after Long Canyon Creek enters on the right around mile 19, and a dirt road climbs via switchbacks up the left bank (alternate take-out).